Tap on a level to open it and see the Level Goals. Begin playing the level by pressing the Spin button to fill the bottom reel with gems. Choose a square above a gem in the reel to place that gem there. When placing a gem, it must match at least 2 other gems of the same color to be placed. Matches are not limited in shape or size except needing 3 or more same-colored gems to be considered a match. 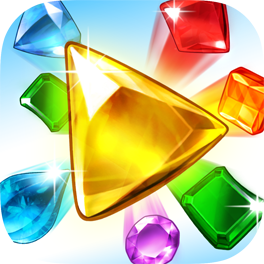 Matching all gems from the reel will award a Free Spin and increase your Score Multiplier by one. Reach the Star and Level Goals before running out of spins to continue through the Lands of Cascade!